Aussie rockers MASSIVE have announced their long-awaited return to the Northern Hemisphere with dates for a UK and European tour. 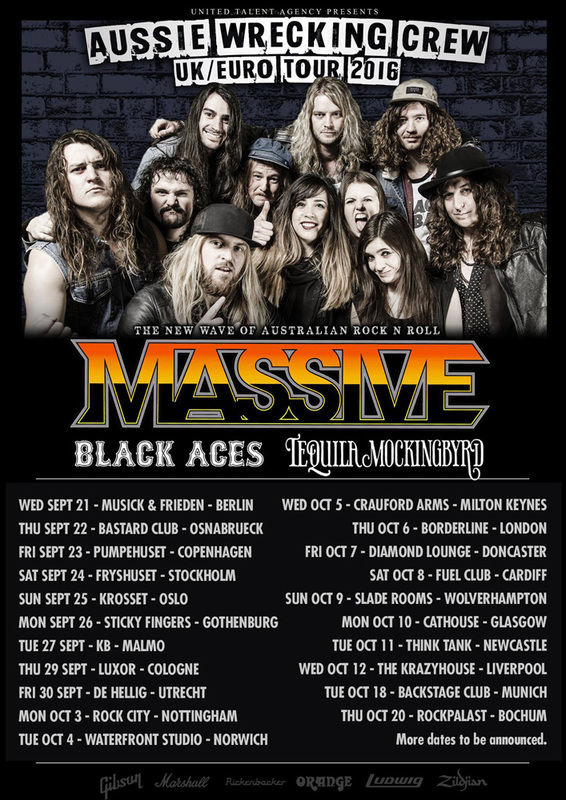 Kicking off on September 21st in Berlin, the Aussie Wrecking Crew UK/Euro Tour 2016 features a killer package of bands from the new wave of Australian rock ‘n’ roll, with MASSIVE being joined by BLACK ACES and TEQUILA MOCKINGBYRD. Following their first ever European tour in 2014 and years of trekking around their native Australia, where the band would routinely travel thousands of miles between shows – a core topic on their aptly-titled new album ‘Destination Somewhere‘ – MASSIVE recently made the huge decision to relocate to Europe to fulfil their dream of becoming full-time touring musicians. Next Obey album launch – Stoke Sugarmill, August 6th, 2016.